It’s a story of loyalty and redemption, set against the death of the music industry. Poor thing. In the previous century, young kids deluded themselves into thinking "musician" was a viable career path. Follow two kids from Who Cares, Alabama as they form a band, experience their big break, release an album, and disappear into obscurity. All the fun you'd ever hope to find in a fictitious account of a 1990s alt-rock band almost going mainstream. If you still think you missed the train to Mars, if you miss the lands of green and skies of blue, this could be the novel for you. Gene Kendall's work explores drama, music, and pop culture with wit and no small amount of sympathy for the losers and also-rans. Currently, he's contributing to CBR.com's ' "Comics Should Be Good" blog. 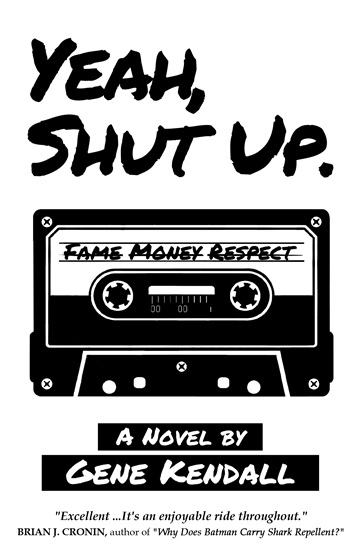 His first novel is a story of loyalty and redemption, set against the death of the music industry. Poor thing. You might enjoy it. He's too punk rock to give you the hard sell. transition with his protagonists...It's an enjoyable ride throughout. Brian J. Cronin, author of "Why Does Batman Carry Shark Repellent?"